This article is about the E model. For the C model, see McDonnell Douglas F-15 Eagle. The McDonnell Douglas F-15E Strike Eagle is an American two-seat multirole fighter (derived from the F-15 Eagle) designed to perform air-to-air and air-to-ground missions. An array of avionics and electronics systems gives to the F-15E the capability to fight at low altitude, day or night, and in all weather. The aircraft uses two crew members, a pilot and a weapon systems officer. Previous models of the F-15 were assigned only air-to-air roles; the "E" model is a dual-role fighter. It has the capability to fight its way to a target over long ranges, destroy enemy ground positions and fight its way out. Usually Strike Eagles can be distinguished from other F-15 variants by darker aircraft camouflage and conformal fuel tanks mounted along the engine intake ramps. 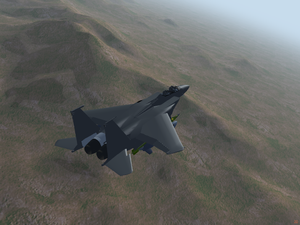 Currently the FGUK version has got a 3D model, a Yasim FDM and selectable payload. This page was last modified on 28 June 2016, at 05:18.